Plot – Middle aged no-hoper and one time arcade game loving Sam Brenner (Sandler) is called upon by his old best bud and now American President Will Cooper (James) to help save the world after aliens mistake old-school video games as an act of war. Pac-Man has never been more dangerous. 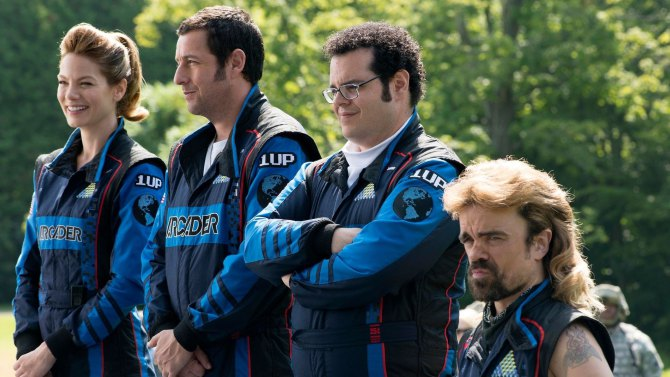 Spoken about regularly as one of 2015’s worst films, Pixels is a dire comedy made by and starring a bunch of people that should know better and a film that thinks some good old fashioned gaming nostalgia will be enough to win us over despite the fact this ‘comedy’ is scarily bereft of laughs, charm and features a cast that looks like they would rather be somewhere else, spending the money they earnt here on a not well earned break. I can’t recall from recent memory a film that feels so tired, so bored with itself, almost resigned to the fact that it’s not fun and it doesn’t help at all that in a recent career full of bad roles and lethargic performances, Pixels features Adam Sandler at his very worst. The Oxford dictionary better update their recent editions as tired and uninterested needs to place a picture of Sandler under those definitions. Sandler’s avid old school arcade gamer Sam Brenner is truly one of the worst leading characters of modern film. Possessing neither a comedic timing, an ounce of actual effort or any genuine hint of life, Sandler is but a zombie walking through this ugly looking cavalcade of ideas and uninteresting action scenes, scenes that are reminisce of someone playing a fun game but never sharing the controller as you sit back and watch. Sandler’s career has once and for all slumped to a new low personnel low and the same can be said of director Chris Columbus. The man responsible for the first two Harry Potter films, Mrs. Doubtfire and Home Alone and also the writer of Gremlins and The Goonies, it’s clear Columbus knows a thing or two about entertaining people through the medium of film but Pixels seems devoid of entertainment and Columbus must be blamed for so blandly directing this wannabe franchise starter. Wasting not only the chance to merge gaming lore with big screen thrills but support from the likes of an unbelievably bad Peter Dinklage (Tyrion would be sorely disappointed) and the sad supporting turns from actors like Sean Bean and Brian Cox. Any movie that casts Kevin James as the American President was going to have a hard time succeeding but really there is no excuse for Pixels to be so downright boring and lacking in joy. Getting a star purely around the fact it has some nice ideas that never eventuate into their potential, Pixels is such a sad state of affairs that many of its cast members will be wishing they had another life to spend on not signing up for this disaster in the first place. As for the idea of this becoming a franchise, game over man….game over. I didn’t hate this, but yeah, it’s not a great movie. Just like all Adam Sandler flicks. Nice review. Yeh I dono man, he seems to be getting worse and worse. What annoyed me is this film had a cool idea but no execution of it. I think Pixels was harshly criticised based on its cast alone … I bet it someone like Chris Pratt were in it, Pixels would have received more favourable reviews … In any case, I actually enjoined the film for what it was … Goofy fun! I was willing to go along for the ride Mr. Movie but even as an avid gamer didn’t enjoy any of that side of it and as a comedy felt it was just in dire need of a better script. Each to his own I guess, but I think people should cut the film some slack as it’s just a bit of light fun really! Yeh agreed mate, I think sometimes people are to harsh on films of this ilk sadly with this one I to didn’t have any fun with it even though I was quietly hoping it would be a good fun guilty pleasure. Yeh his 2015 was certainly something to remember ha, for all the wrong reasons! Ugh. Watched this over the weekend. Ugh. Just… Ugh. I feel your pain Mutant! I was kind of, almost excited to watch this at one point. But the mere presence of Adam Sandler is just too off-putting. It’s a cool idea, the premise reminds me of Ready Player One. Have you read it? It’s an excellent book that Spielberg is adapting to film, hopefully he’ll do a better job than this! I’ve only barely heard about Player One but with the talent attached to the film I can’t wait to see it!